Mike Sweeney has played baseball for the Seattle Mariners for the last two years and before that he did a one year stint with the Oakland A's. 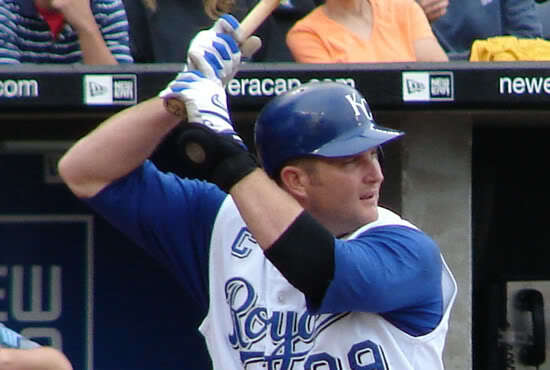 Prior to that though, he played for the Kansas City Royals. He was drafted by them, went through their farm system and was eventually named the team captain. He was the annual All-Star pick and best player for several years. Prior to the 2003 season, he signed a five year contract for $55 million. Unfortunately, after that he suffered injury after injury that limited his playing time and after the 2008 season he was not resigned. As someone who has been a Kansas City Royal fan since I was knee high, I was a Mike Sweeney fan. You don't have to be a Royals fan to be a Sweeney fan though. He is genuinely one of the good guys. He is friendly, always smiling and just down right nice. After games, he could be relied upon to go out to where all the fans were and to sign autographs instead of pretending the fans weren't there like many players do. And if he couldn't sign, he would tell the fans why. "Sorry guys, I have family in town I have to go meet," he would yell or "Sorry, I have to go get ready for the game." This short explanation showed that he cared. Mike Sweeney taught me more than how to be a nice guy though. You see, Mike Sweeney is Christian and he lives his faith and he isn't afraid to talk about it. He puts a biblical quote on his autographs. He gives talks at Christian family day and shares his faith. But more than that---Mike Sweeney is CATHOLIC!!! What!?! A Catholic man who not wears his faith on his sleeve but gives testimony?!?! That's crazy! I had never heard of such a thing! He taught me that it was okay to do that. Before that, I was hesitant to reveal my faith to people because I was a bad Catholic and was embarrassed. I didn't want to look like a hypocrite. I'm still a bad Catholic but I'm proud of my faith and simply let people know I'm a sinner--a work in progress--and I'm trying to do my best but I fail. And with the help of God, I try try again. The last eight years must have been rough for Mike Sweeney. He was a the peak of his career, got married, had children. Then he suffered injury after injury. He suffered chronic back pain. He had to leave the city where he was once crowned "captain" and take a pay cut from $11 million a year to the league minimum just in order to make teams and still play the game he loves. But, Mike Sweeney remains the same nice, caring guy who goes around hugging people. Throughout his suffering, he still remains thankful to God and still counts his blessings. I'm still learning from Mike Sweeney.